For this assignment, we had to create a pom-pom bot using Arduino and servo motors. The process was simple, but a bit challenging. This was my second time working with Arduinos, and the process went pretty smoothly, and I did not encounter a lot of difficulties. The coding part of the assignment was straightforward, and there was little to no complexity to it. The most important part was to create model of the robot, so that it can move without any difficulties. The first part of this assignment was to come up with a concept of pom-pom bot. Initially, I thought about creating a spider, which would have six legs. 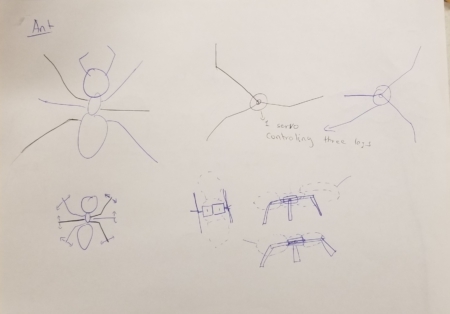 I watched couple of videos on how spider walks; it helped me get a clear idea on how to design the robot. It was interesting to see that spider move its all the legs independently, and without a lot of coordination. To create a spider bot, its legs should move differently from the movements of other legs. I thought that the it would be bit challenging to create that, because it would need about six servo motors to create something like that. I moved on from spider, and decided to make an ant like bot. The process was less complex than spider, because there was good coordination between the legs. The sketch gave me a clear idea of constructing the body of the bot. My first prototype was basically creating a basic structure of concept that I had in mind. It took me two servo motors and few pop-sticks to construct it. Balancing the bot was a big part, because it would fall without the fall. Also the part in which motors where getting rotated, which was not what I thought of. I also had to figure correct speed and maximum and minimum angle of the servos. For the second prototype, I tried to get rid of the problem in first prototype. I attached additional pop sticks, so that it can balance itself. I also attached two pop sticks in the middle of the bot, so that it does not fall. I also changed the speed and angle of the servo, so that it can move from one position to another. After making those changes, it worked well. After getting done with the second prototype, the bot walked the way I wanted it to walk. So, for the final prototype, I focused on creating body of the bot and also trying different speeds and angles of the servo. One problem that I struggled with was that I did not note down the values for which the bot walked. So, after changes the values, I loosed the delay and position values of servo. The final bot was not able to walk like second prototype. However, the final product turned out well, and I was happy with the result.